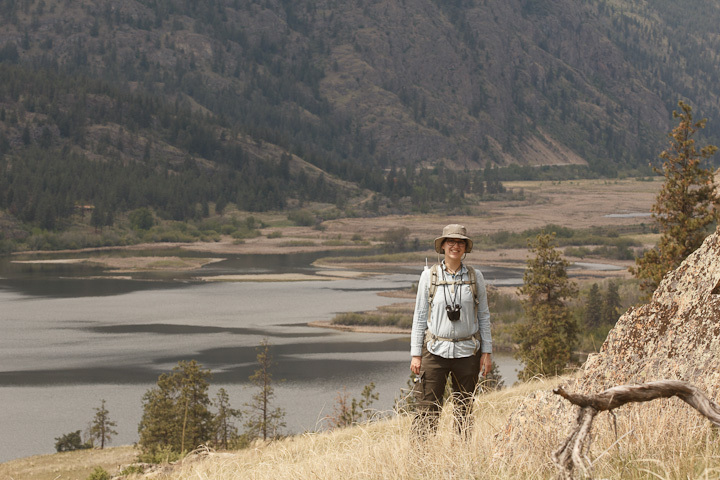 I have been a bit remiss in continuing to tell the story of the trip Catherine and I took to the Okanagan Valley this spring. I apologize, and in recompense, offer one of the most exciting observations we made. 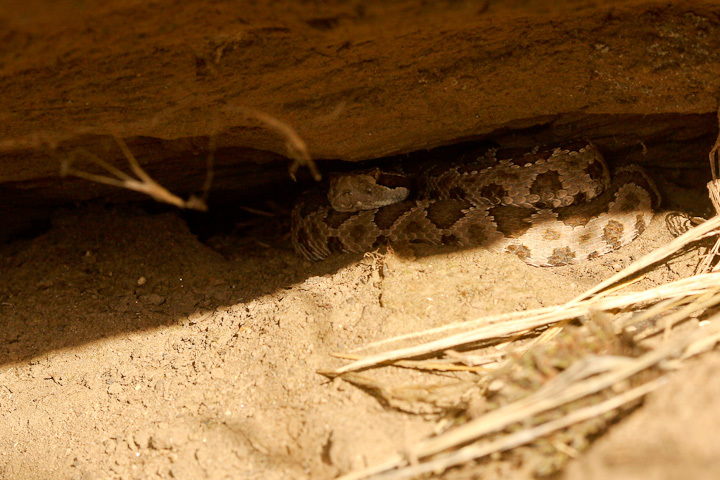 One of the species we had most hoped to see was the Pacific Rattlesnake, Crotalus oreganus. I was anticipating that being early in the spring, the snakes would still be close to their winter denning sites, perhaps engaged in mating. As it turned out, we were too late. 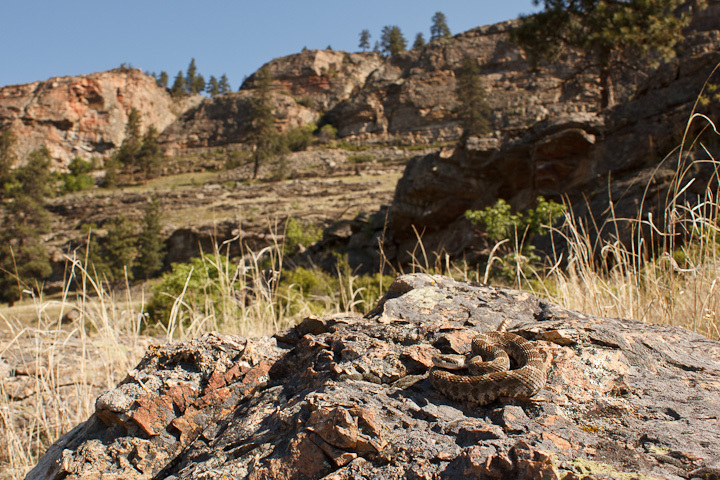 The snakes had already left their den sites for more productive hunting grounds further down the valleys. 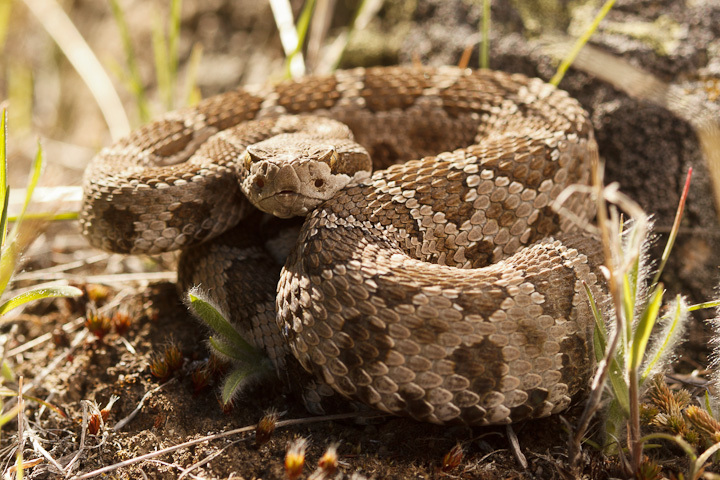 The Pacific Rattlesnake is BC’s only rattlesnake, and like many northerly populations of rattlesnakes, is a threatened species. The reasons for the rarity of these snakes is that they have been persecuted by humans, and their habitats are being threatened by development. 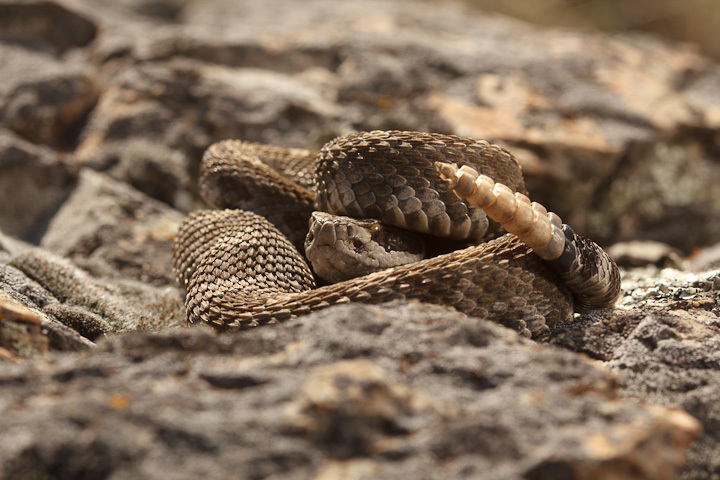 Persecution of these snakes was particularly damaging as they rely on safe hibernation sites, free of freezing conditions, and must migrate to these sites en masse in the fall. This means that entire populations of the snakes may end up in just a few suitable caverns, where humans can find and destroy them. This is in fact what has happened, not just in BC, but all over North America wherever these denning sites occur. 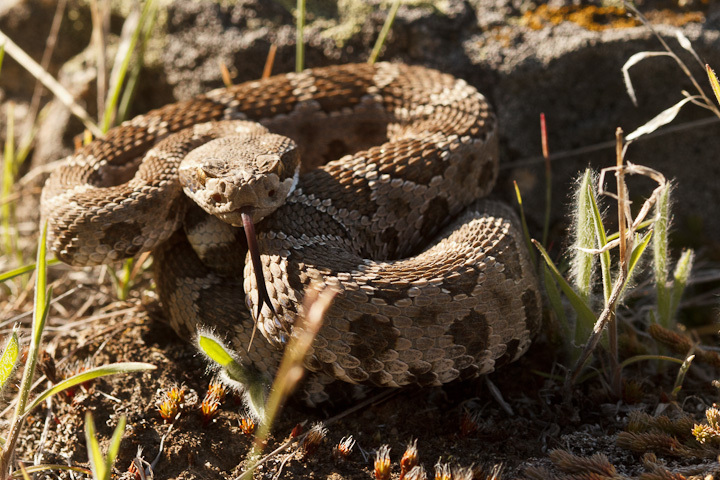 In BC, there was a bounty on the snakes, and some people made it their mission to destroy every snake they could, dynamiting and gassing the dens. 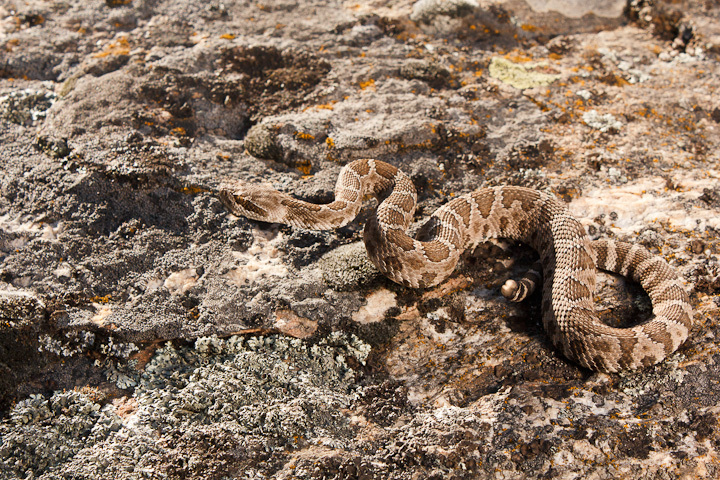 Snakes and roads don’t mix: my unfortunate first encounter with a Pacific Rattlesnake. The snake was decapitated by a truck I was driving, Aug 22, 2008. In addition, the seasonal migration also poses extreme risk as the snakes must often cross roads to get to where they are going. Needless to say, cars do not mix well with snakes, and death on the roads is undoubtedly a major threat to the species. I know this all too well, as my first encounter with this species was a fatal one. 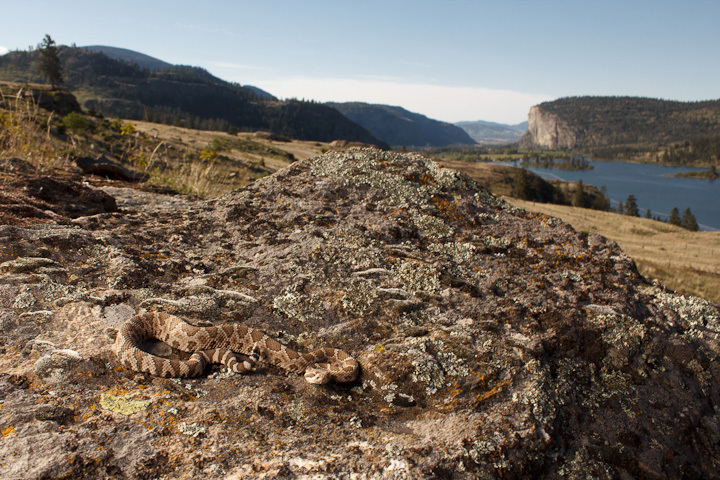 Years ago, I was driving a truck doing fieldwork in the Similkameen, and hit a snake on the way to a campsite. I felt terrible about this, but by the time I saw the snake, it was too late. 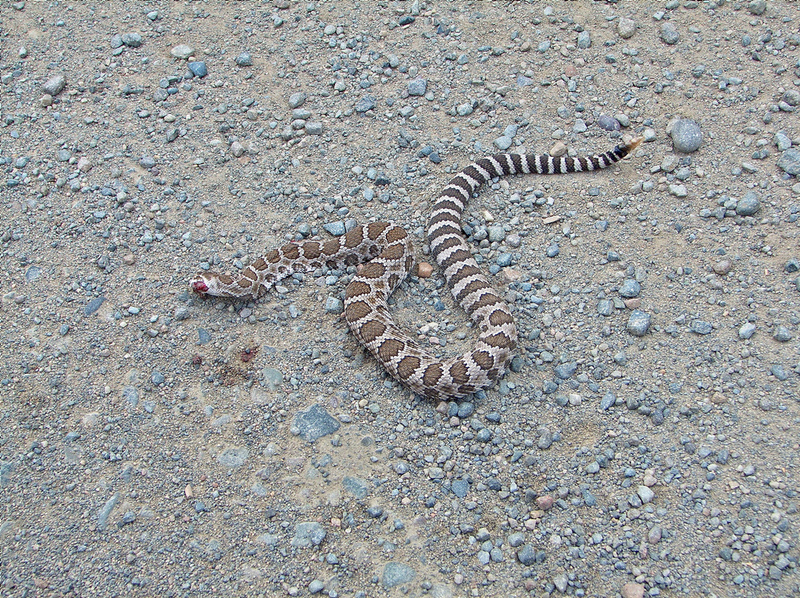 Later that evening, I walked out on the road I had driven up, and saw 7 more freshly killed rattlesnakes! This was likely due to an active log hauling operation using the roadway, but really even a modest amount of vehicle traffic would kill snakes. The 8 I saw killed that day is a ridiculous amount of excess mortality for a long-lived and not very fecund animal, and it means that the population of these snakes is in decline. On the lookout for snakes, spiders and whatever else we could see. Every time Catherine and I were in likely areas, we would look at potential den sites with eyes keen for the snakes, but to no avail. We had a bit of inside info on historic den site locations, and so we felt well-prepared. Alas, the snakes did not show up. It was not until late in our trip that we checked out a site near Vaseux Lake. 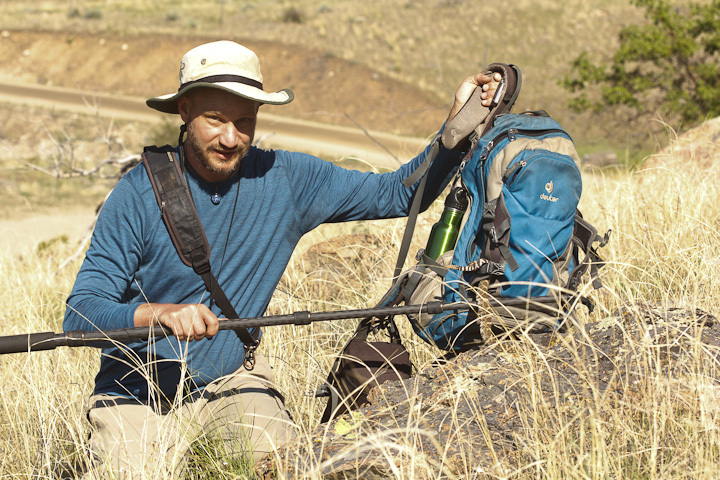 Here again we did not find any rattlers, but we did find a snake-catcher’s equipment in one of the likely den sites: tall boots and a large bucket. This was likely from someone in animal control or perhaps a pest control business that had used these to transport rattlesnakes to the den from someone’s house or other building in the fall (sometimes the snakes will end up in these locations on the way to their dens). This was most encouraging! We occupied ourselves taking pictures of spiders and insects in the grasslands near the bluffs, always with an eye out for snakes. In the same area where we found the racer, I finally spotted one! This was quite a small snake, and when I saw it, it was fleeing our approach (I had thought they might just stay still, like Bothrops). Unlike most snakes which I am familiar with, this is a pitviper, adapted for camouflage and ambush predation, rather than quick flight. We wanted to get some photos, so I picked the snake up on my monopod and placed it in an open area. The little snake was obviously not too pleased with this, but only gave a halfhearted, barely audible rattle. In addition, at no time did the snake strike the stick. It was fairly easy to keep the snake in place just by moving the monopod in front of its head, and it soon just settled in a defensive coil. This made it very easy to photograph, although if I had a polarizing filter for the brilliant sunshine, the shots would have been better! The ease I had handling these snakes is in stark contrast to just about every other snake I have met. They are relatively slow and cumbersome animals (though the strike is likely very quick). I have no doubt any reasonably capable adult could move any “threatening” snake from their premises easily with a large bucket and a stick. 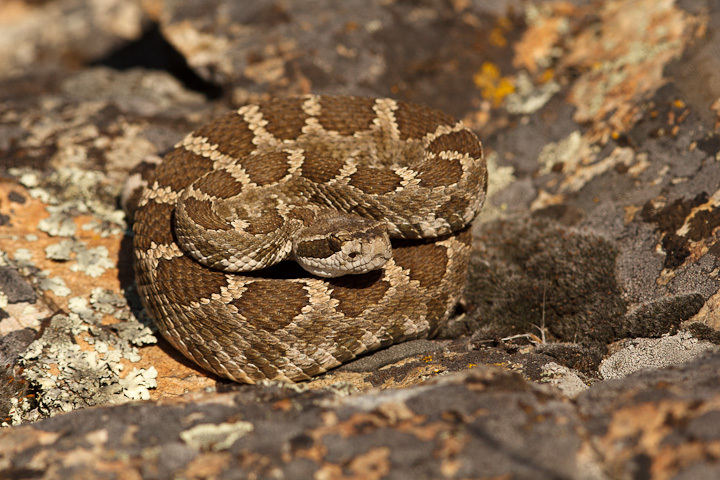 Nonetheless, these snakes are still regularly (and legally) killed to “protect life and property”, which means that enforcement of their protected status is a nebulous concept. The snake was absolutely beautiful, with chocolate-brown patches on a cream background. This eye-level shot shows off the heat-sensitive pits (large holes on the front) which the snakes use to sense their warm-blooded prey. 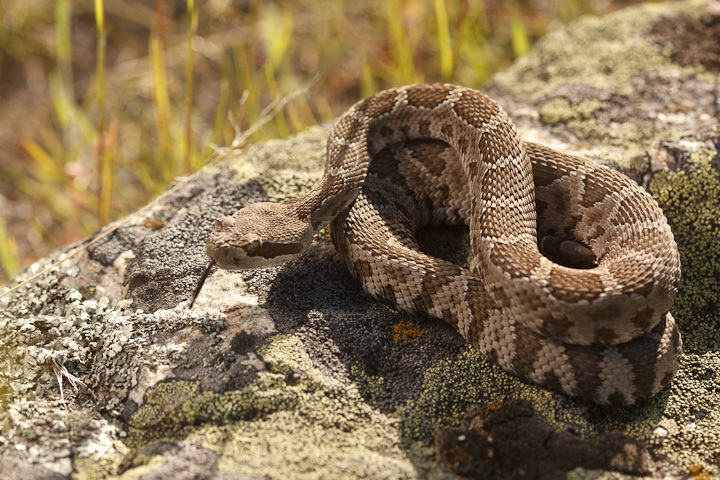 The vertically-slit pupils are a hallmark of predominantly-nocturnal snakes. Landscape with reptile: a wide and close shot to show the surroundings. This shot (like many of the previous shots) used a bit of fill flash in order to make the snake stand out. This is how the snake looks in the grass. Very obvious if moving, but if coiled under a plant, it would be hard to spot. After a short session (we did not want to stress the animal too much), I nudged it under a large rock, which would be a safe place for the animal to hide. With these photos, it is obvious that the animal was manipulated into position for photography, and some might take issue with this from an ethical standpoint. I see where this comes from, and I agree somewhat. 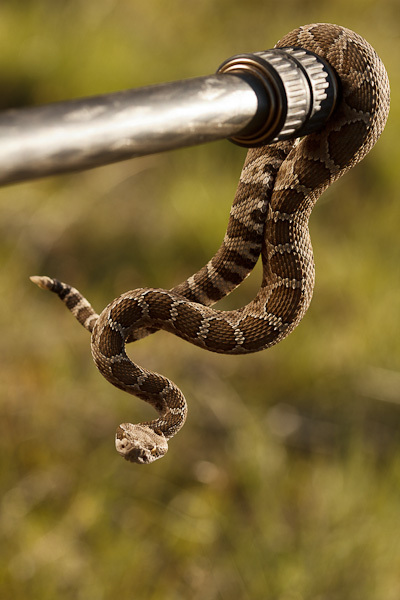 The snake obviously does not like being handled, and in point of fact, the majority of snakebite accidents probably happen as a result of handling. That being said, from the standpoint of this snake, what has occurred is that the snake was threatened, it could not escape, it stood its ground, and the dangerous animal (me) went away. In the life of one of these snakes, with hawks, cattle, dogs and cars to contend with, this is really small potatoes. Anyway, it wasn’t long before we found a second, slightly larger rattler. This one was also fleeing, and in fact did not need capturing, as it took shelter under my backpack, getting caught around the straps in the process. 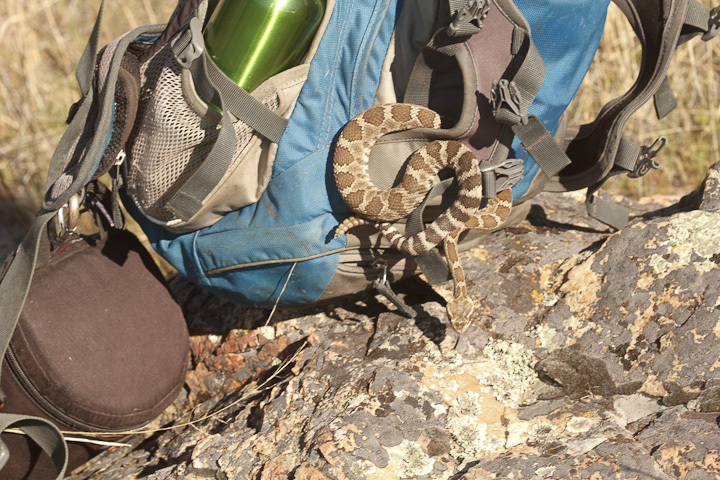 Getting it into position for photography was just a matter of moving the pack to an open area and coaxing the snake out. snake in a pack! Photo by Catherine Scott. removing the reptile. Photo by Catherine Scott. The sun was definitely more harsh in this shot, and a polarizing filter would have come in handy! You can tell that this larger rattler has molted more times than the other, as its rattle has more segments. 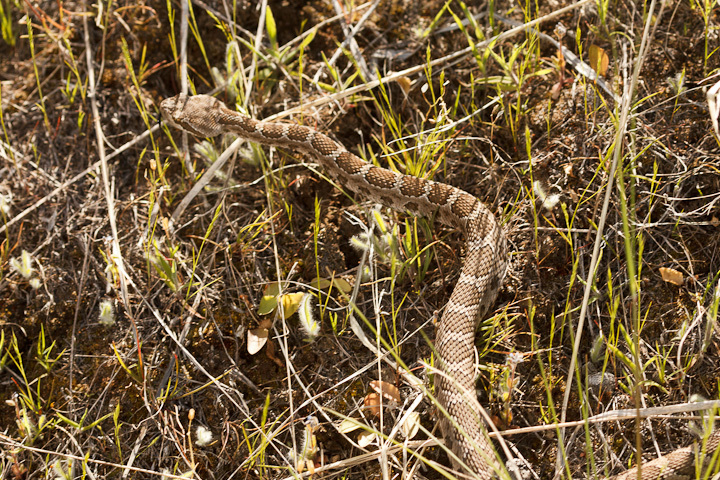 With this snake, I tried the 300 mm. It compresses the perspective, makes the colours pop a bit, and overall emphasizes the snake. Again, a wide and close shot to put the snake in the landscape. This accomplishes the opposite of using a telephoto, but can also produce a pleasing composition. 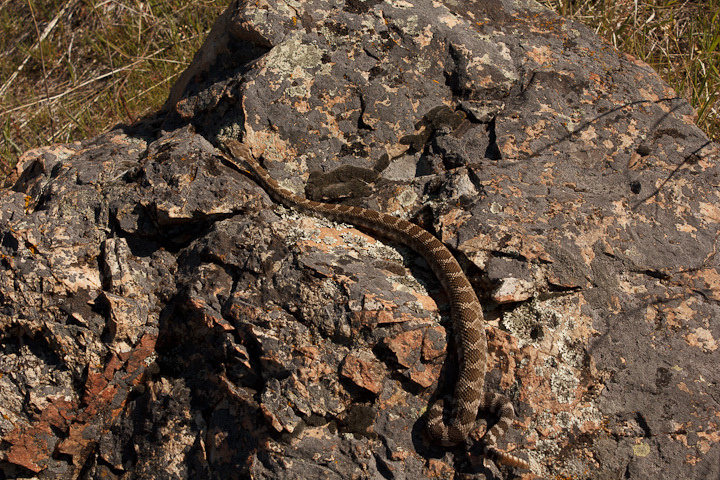 After a short photo session, the snake just disappeared into the next rocky overhang. And that was the end of our rattlesnake adventure! Great photos and commentary. You’re developing a really good and unique style.